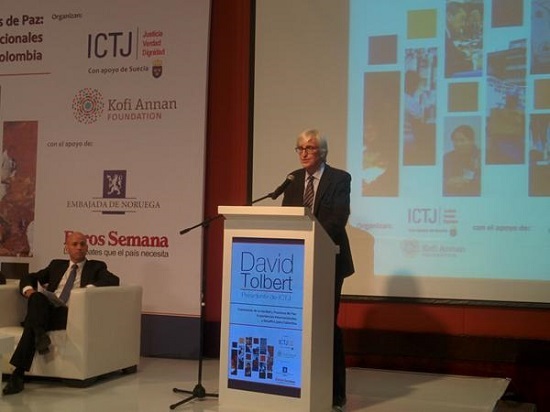 With Colombian President Juan Manuel Santos and former UN Secretary-General Kofi Annan in attendance, ICTJ President David Tolbert opened the conference “Truth Commissions and Peace Processes: International Experiences and Lessons for Colombia”. In his opening remarks Tolbert stressed that in Colombia those who have suffered human rights abuses have the right to know the truth and they also, rightly, have strong reasons to expect and demand that a new social arrangement will at least recognize their plight and address their injuries. “The concerns about truth have not simply emerged in Colombia with the peace negotiations in Havana. In fact, the country has already demonstrated the existence of both social demand and distinct capacities for clarifying historical memory through a number of processes that have brought important advances in this field,” said Tolbert. Tolbert pointed that, in the current context, it seems that one new major step on truth seeking for Colombia will be advanced by incorporating a truth commission into the Havana peace agreement. “This decision will come in a context where a previous decision to create a truth-seeking body already exists within the legal framework for peace,” emphasized Tolbert, asking several questions that Colombia is facing in this context: “Does Colombia need a truth commission after all the truth revealing efforts, official and unofficial, that have already existed and exist to this day? What would be the added-value of a truth commission at this point in the Colombian search for peace? How would that commission relate to the other essential tasks lying ahead, namely, making accountability possible, introducing key institutional responses, addressing the victims’ plight and spreading social awareness? An important premise Tolbert pointed to was that a truth commission should not be seen as a substitute for the judicial system or judicial processes, which have their own logic and responsibilities. He proceeded to outline a number of relevant international experiences that may be of relevance for Colombia. “Taking these lessons into account, it is clear that the negotiators need to create a mandate that reflects, after proper consultations, society’s demands for truth but in a manner that is functional and can be implemented. The time period covered must be realistic enough to be adequately investigated by the truth commission,” stressed Tolbert. In conclusion, Tolbert returned to the key question: “Why a truth commission in Colombia?” What can it offer to a society whose yearning for truth and whose quests for truth have been intense for many years now? Do we expect that a truth commission will spur an encompassing public dialogue dealing with recognition and responsibilities and lessons to be learned? Is a truth commission called to integrate and raise the visibility of so many previous efforts in the same direction, efforts comprising the voices of so many thousands of victims? Must a truth commission be the opportunity for victims to be publicly heard in an official setting? Are there any aspects or pieces of this complex truth still awaiting strong public official recognition and is that the proper role of the truth commission? “It is always necessary to distinguish between a truth commission, which is an institution, and the goals and problems to which it answers. The origin of any truth commission is a perceived deficit of truth. A truth commission, even the most encompassing and complex one, is able to respond to critical aspects of that deficit but never to the whole of it,” said Tolbert. In Colombia, that deficit comprises the vast problem of enforced disappearances and certainly the clarification of a wide array of criminal events; they include the lack of access to archives (especially those of security agencies) as well as a clarification of the responsibilities of institutional, political, and economic actors, among many other aspects.